To most people who have lived in Singapore for some time, this is nothing new. It is certainly nothing new to me, but today I feel fed up enough to raise the issue on my blog. Before I started writing this article, I searched on google images as I usually do to find any appropriate or relevant pictures. To my surprise, I found a couple of articles covering this topic dating back to last year on popular Singapore news websites. 'Shop n Save' (owned by the Dairy Farm Group) is a chain of 'smaller' local supermarkets, usually located in convenient locations, making it useful for shoppers on their way to or home from work. In my case, I frequently visit the Shop n Save at Admiralty MRT on my way home from work for any necessary items (sometimes spending small amounts on milk, bread or fresh fruit and veges, other times I may need to grab some more expensive items like baby nappies or formula... my bill might range anywhere between $10 and $100). More than four years ago, the Shop n Save chain kicked off a promotion whereby for every $15 spent on one bill, the shopper receives one 'stamp' for the current month. When the shopper collects 12 stamps in any one month, they can be adhered to a piece of printed cardboard and redeemed for a $9 voucher valid for 3 months. In essence, frequent customers can claim back about 5% of their monthly expenditure in the form of discount off further purchase from the supermarket chain. 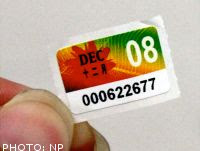 Nearly every month, we accumulate through our purchases enough stamps for two or three $9 vouchers. This is where the 'voucher aunties' come in (this name has been given to these ladies by the AsiaOne news website)... shoppers are 'tagged' by the voucher ladies upon entering the store, and the decision is made as to to who the customer 'belongs' to. Upon departing the store, the shopper is approached by the voucher auntie assigned to them, asking for their stamps. Without a doubt, there are reasons why these ladies do what they do - whether it be financial (remember there is little financial assistance from the Government here for the elderly), or whether it be motivated by greed, the activity should be deemed illegal. Begging is not allowed, however what these people do is akin to the same... they may not be asking for money, but what they do ask for can be converted to product purchases, which is essentially the same result. When a person asks for something for nothing, in my mind they are beggars. Next - it is one thing for these people to approach shoppers and beg for their stamps... however, it is now out of control. 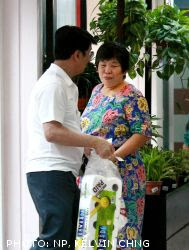 When one replies to say that they either collect the vouchers themselves, or that they did not spend the required $15, it is very common for the 'voucher aunties' to scold the shoppers - and not just mild abuse - it comes in a variety of languages, most commonly hokkien, mandarin and english, and the language that spews forth can be downright offensive. On more than one occasion (actually, more times that I could count on both feet and hands), I have been the recipient of the abuse... I have had my arm grabbed, my clothes pulled, I have had shopping bags snatched from my hand, and have even had the stickers (inside the receipt and change) ripped from my hand. This is clearly unacceptable and the law needs to act. At a minimum, the store management need to do something to control the situation - tonight at Admiralty, I was receiving my change across the counter (inside the store), and I had a 'voucher auntie' reaching into my hand while I was receiving the receipt and stamps. The store clerk did absolutely nothing - the lady was not asked to leave, and even when she began with the common tirade of abuse in front of all the other shoppers, the store manager just looked at her and then looked away - clearly accepting the presence instore and condoning the behaviour. Tonight's incident has crossed the line with me, because the actions of this lady physically grabbing at me and then yelling at me, scared the 'bejesus' out of my 21-month old son, who started screaming in absolute terror!! It took almost 15-min to settle him and let him know that there was no danger to any of us. The time for ignoring the harrassment, abuse and physical encounters must now come to an end. The time for action is here... I implore the management of Shop n Save to take some responsibility here - if they still cannot control the situation, the authorities need to be brought in. This has been going on for four years now, and the situation is worsening. Here is the story I found on AsiaOne today when I was looking for an image for this article. If it happened to me, I'll call the police in. Unacceptable behaviour. Seems that the voucher aunties are not just hoping for some generousity but expecting and demanding their "share". I have come across these ladies, but have been fortunate not to experience any tirade thus far.